Front Door Fashion carries many well-known brands, and one of our favorites is Trina Turk. This line has been around since 1995 and is an industry frontrunner in contemporary women’s clothing. Trina Turk is known for high quality and impeccable detailing which makes it stand out amongst the rest. Trina’s designs are great for all occasions and age groups because of the line’s timeless and feminine look with a modern flare. 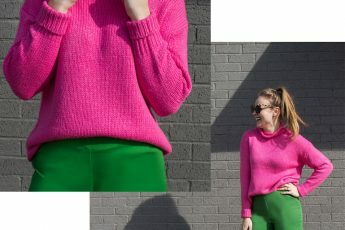 Today’s blog post features a few simple ways we have styled some of the Trina Turk pieces we carry. This piece can be dressed up or down depending on accessories and shoes, but most importantly, it can convert from day to night effortlessly. [keyword, effortlessly]. 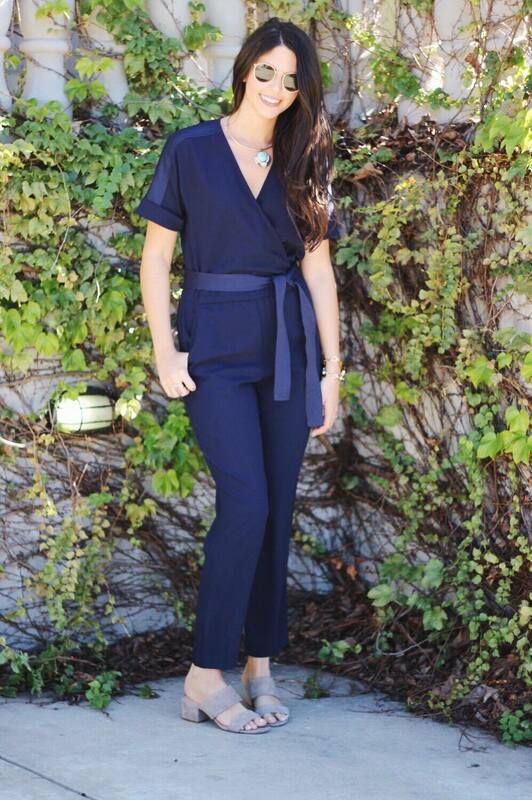 Here’s a styling secret: navy. 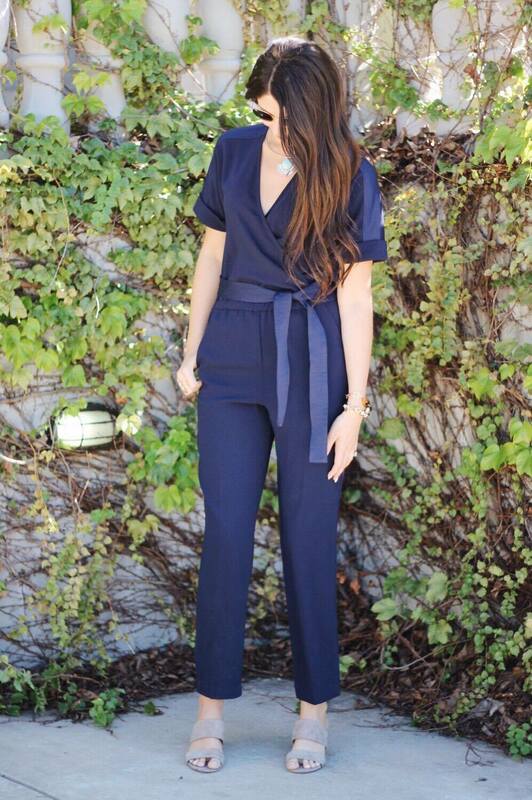 Navy blue is a great alternative to the everyday black. It is still neutral, classic, and can be dressy if it needs to be. And, another styling secret: you can and should wear black with navy. Trust us. Having a good assortment of tops is key to any woman’s wardrobe. Basic blouses with elegant detailing such as this 100% silk red blouse are timeless staples that belong in almost any closet. This bold red represents confidence and strength and is a great shade to have on hand with the holidays around the corner. 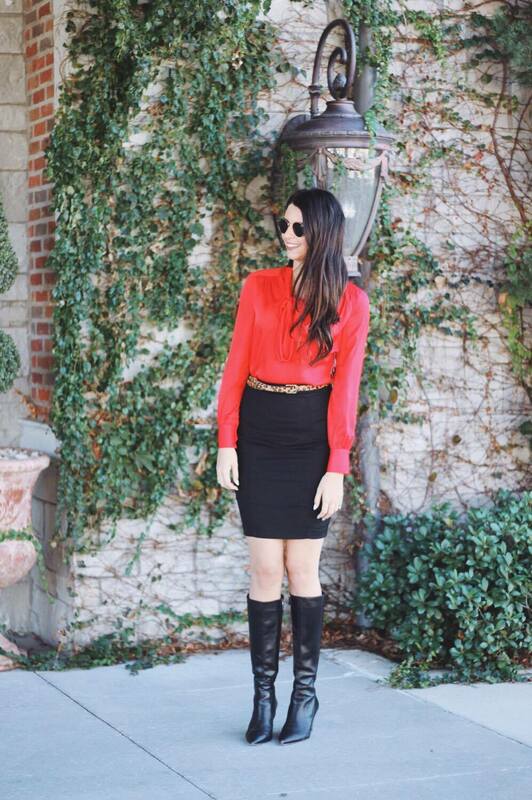 We styled this blouse with a work appropriate black pencil skirt and a pair of dressy black boots. 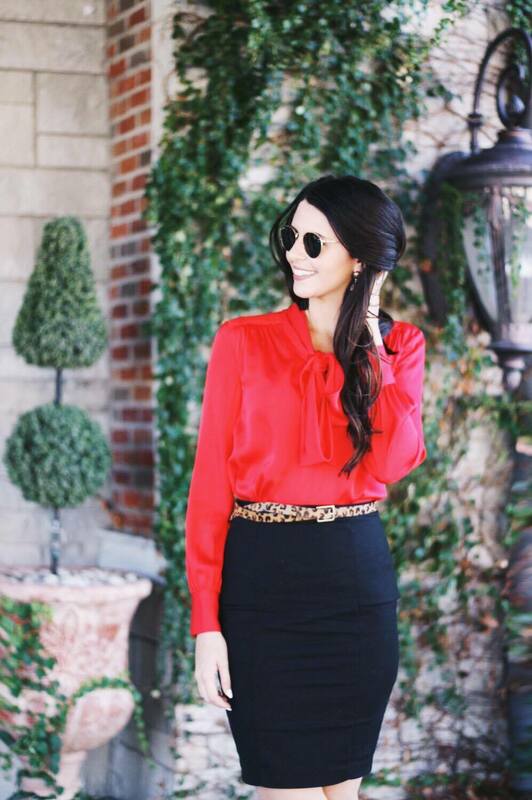 To add an extra pop to this look, we added a leopard print belt which keeps it subtle enough for the office while still being stylish and fun. 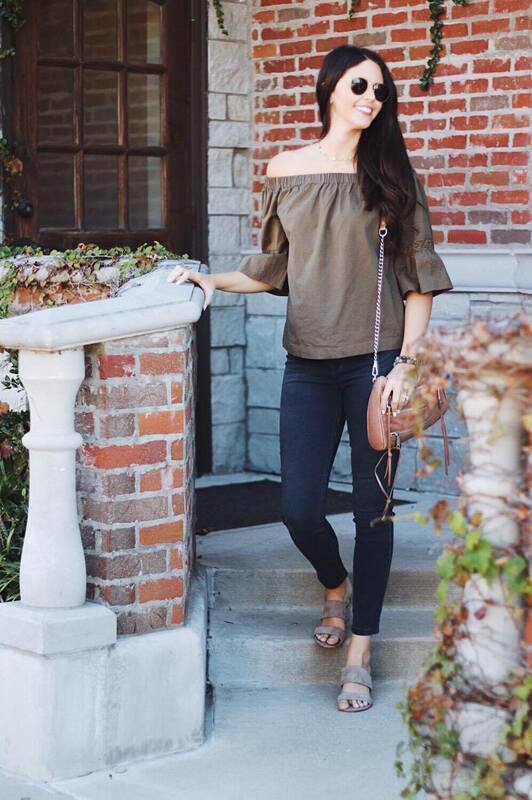 This blouse is also easily worn with almost any pair of denim, and you can never have too many tops easy-to-style tops! 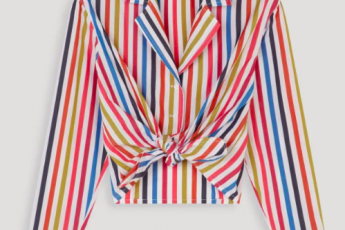 Who doesn’t need a fun statement top for Fall? 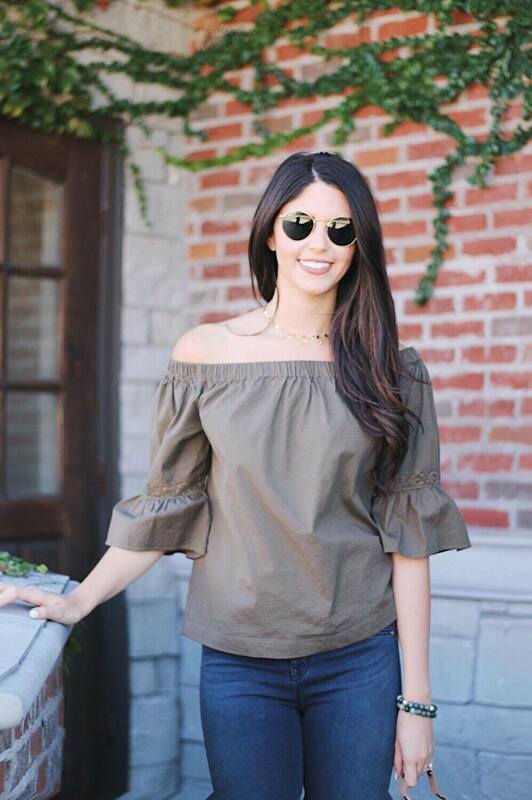 This off the shoulder olive green Trina Turk top is perfect for weekend activities. Pair it with dark wash skinny jeans and wedges and you will be ready to hit the town! This top is figure flattering and can also transition into Spring when worn with white skinny jeans. Having pieces that can be worn in multiple seasons and in multiple ways are investments worth making. These are just a few of the many pieces by Trina Turk that we the pleasure of styling. Leave the work to the experts at Front Door Fashion and request a box here.